SPECIFICATIONS Balancepoint 56,50 Head J Bending (mm) 24 mm Carbon (%)85 Powerindex 10.80 Top of the range Dita Exa 500 NRT J-Shape hockey stick from All Rounder Hockey equipment. Available in 36.5" in Ultra Light weight. 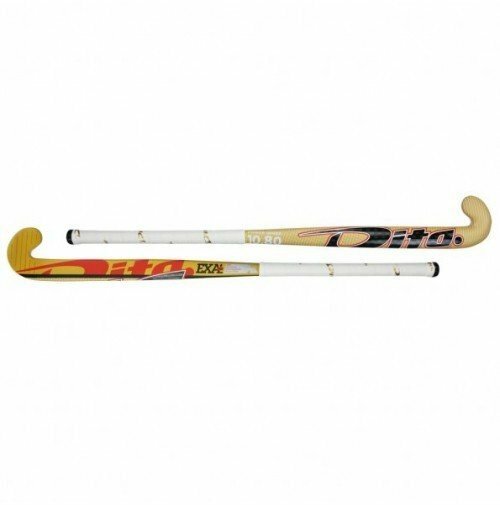 Dita Exa 500 NRT J-Shape Hockey Stick brought to you by All Rounder Hockey for the hockey season. Ultra lightweight Dita hockey stick for optimum ball-handling. Because of the stiffness the Dita Exa 500 NRT J-Shape is also an extremely powerful hockey stick. The Dita hockey stick grooves discharge water for more accuracy and hitting power. SPECIFICATIONS Balancepoint 56,50 Head J Bending (mm) 24 mm Carbon (%)85 Powerindex 10.80 Top of the range Dita Exa 500 NRT J-Shape hockey stick from All Rounder Hockey equipment. Available in 36.5" in Ultra Light weight. Colour: Gold/Red/White.